SACRAMENTO, CALIFORNIA (February 23, 2018) – Super Late Models will roar in Roseville three times in 2018, as the Pacific Challenge Series presented by PenneyLawyers.com hits the All American Speedway. The Bill McAnally-promoted facility will welcome the PCS on May 19, September 8, and the series’ championship finale on October 13. The one-third mile speedway at the newly renovated The Grounds (previously Placer County Fairgrounds) serves as the unofficial home track of the series. It is the geographical center of the 2018 campaign with many teams and series supporters located in the greater Sacramento region. Roseville joins previously announced races March 17 and August 11 at Madera Speedway, April 21 and June 23 at Shasta Speedway, and July 21 at Stockton 99 Speedway. All American Speedway has hosted 19 events between the PCS and its AABLM predecessor. Two-time champion Jeremy Doss leads with six career wins while Jason Romero has won five PCS races at his home track. 2017 PCS champion Mike Beeler has attended all 14 races since the series became the PCS and used a seventh place finish in last year’s finale to claim his second series championship. 19 cars competed in the race with Matt Wendt scoring his second career series win in a crowd-pleasing near photo finish against 2009 track champion Romero. 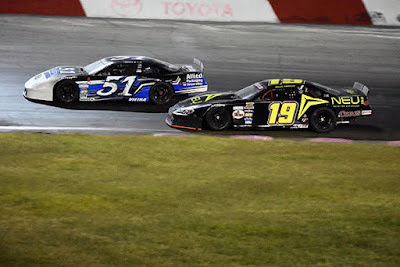 The 2018 series’ finale in October is again paired with the NASCAR K&N Pro Series, West and North State Modifieds for a potent night of racing action. Nearly 5000 fans attend the event each year. Local divisions such as Limited Modifieds, Bombers, and F4s will be paired with the PCS for its other two visits. The management team at Kern County Raceway proudly announced the 2018 Dirt Track schedule today. The 11 race season will begin on Saturday, April 7th with the return of the NARC “King of the West” 410 Winged Sprint cars and will conclude 7 months later with the same series making its second trip of the year to the ultra fast third-mile clay oval! In between the book ended 410 Winged Sprint Car shows; fans will be entertained by a full slate of racing action. Highlights of the season feature championships for the A-Mods, B-Mods, Hobby Stocks, American Stocks, Mini Stocks, Mod Lites, Mini Mods, and Mini Dwarfs. Returning for the third year, with a new name, will be the “So-Cal Super Nationals” on Friday, September 7th. This event allows A-Mod and B-Mod racers a shot at increased payouts and great racing with some of the best in the West!